For more than 50 years, the R Adams Cowley Shock Trauma Center has been a worldwide leader in trauma care. Shock Trauma is the heart of Maryland’s exceptional Emergency Medical Services (EMS) — the first coordinated system in the country and a national model of excellence. To date, more than 200,000 people have been cared for at Shock Trauma. WE HEAL At one of the highest-volume trauma centers in the United States, teams of providers are standing by 24/7 to receive, resuscitate, stabilize and treat those whose lives are threatened by time-sensitive injuries, including: acute complex orthopaedic injury, spinal injuries, brain injury, facial trauma, multiple organ dysfunction, respiratory failure, soft-tissue infection and sepsis. WE TEACH The Shock Trauma/Surgical Critical Care Fellowship is the largest and one of the most prestigious programs of its kind. The goal of the fellowship is to produce physician leaders in academic surgery who specialize in critical care and trauma. WE DISCOVER The Shock Trauma research program aims to become the benchmark for national and international trauma research that addresses issues of injury in prevention, patient care, delivery of care, public policy and financing of trauma care and systems of care. The program includes: clinical research trials, a place to test emergency technologies and a collaboration with the U.S. Air Force through the C-STARS-MD program. 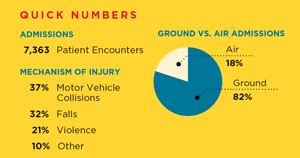 WE CARE In keeping with the mission of preventing severe injury and death, teams from Shock Trauma conduct a variety of prevention programs in collaboration with schools, community groups and the court system. The programs target adolescents and adults on topics including seatbelt use, violence prevention and safe driving strategies focused on eliminating distracted or impaired driving. 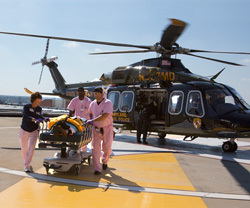 To read more about the Shock Trauma Center, visit umm.edu/shock-trauma. The Honorable Steven J. DeBoy, Sr.
Mr. Kenneth W. DeFontes, Jr.
Mr. George L. Doetsch, Jr.
Mr. Bruce R. Grindrod, Jr. The Honorable Johnny Olszewski, Jr. The Honorable James T. Smith, Jr.
Mr. Edward A. St. John, Jr.